Thus, it may not surprise you to hear that the Parisians have spared no expense implementing a city-wide bike sharing program, which launched in summer 2007 and sufficiently upped the City of Lights’ green ante. Inspired by the success of a similar program in Lyon, France, Paris city officials devised a plan through which cyclists can purchase riding credits at any of the 1,450 self-service rental stations, grab a bike, and go. Users then can return their wheels to any station, making one-way trips a breeze (and, incidentally, these short bike jaunts outpace any other form of transport in Paris, according to a city-commissioned study). The signature bikes, complete with bells and baskets (de rigeur en Paris! 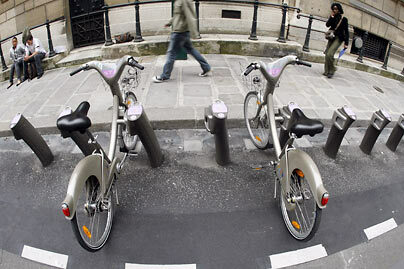 ), are called Vélib’, a portmanteau of velo and liberte (liberty). The cost? About $1.30 USD/day. The first 30 minutes are free; after that, cyclists pay by the hour. In the first year alone, Parisians made 27.5 million Vélib’ trips. With motor traffic congestion and pollution on the rise, a bike sharing program sounds positively brilliante! While approximately 3,000 of the 20,600 bikes have gone missing, the program is nonetheless a good investment in the health of both the city’s inhabitants and air quality. Could a program like this work in your city? Seattle is kinda hilly, so maybe we’d need 21-speeds. Would your hometown people get out and ride, do you think?